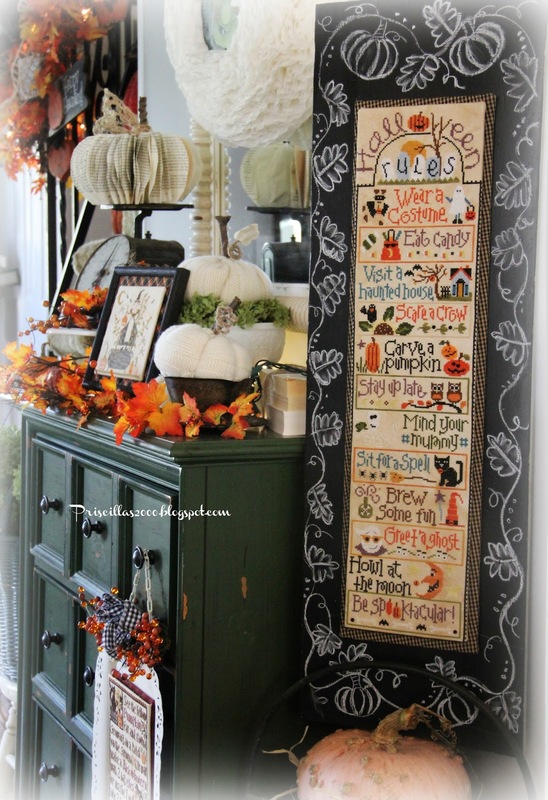 Lizzie Kate Halloween Rules .. So.. I had decided how I was going to do this ..I just ad to get the board cut and chalkboard painted ..I had a little help from one of my sons today ..and got this finished ,I still haven't decided where it is going to be displayed.. but don't you love it? I had 2 light weight pieces of board cut at Home Depot to mount both the stitching and the other piece was used for the black homespun check ( on the bias) to use as a mat for the stitching. I glued the two pieces together and also glued it to the board. 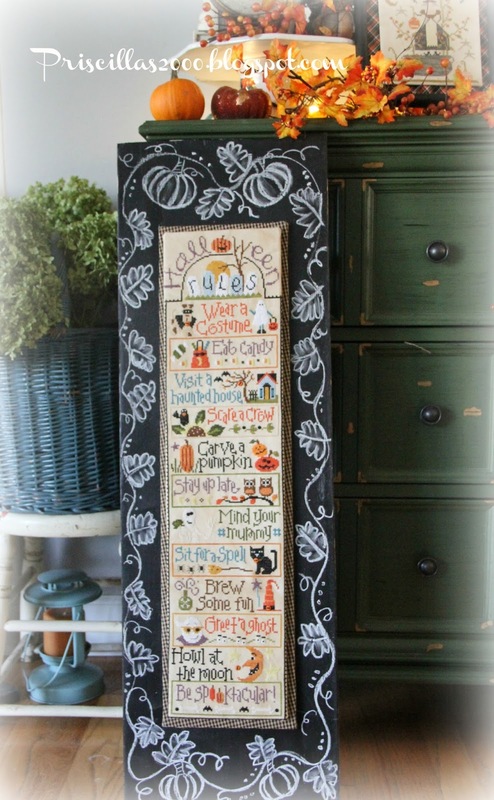 I knew I wanted it to be just black and white ..no colored chalk .. and a simple pumpkin leaf garland all the way around. Oh my gosh I am so excited it turned out just the way I wanted it! 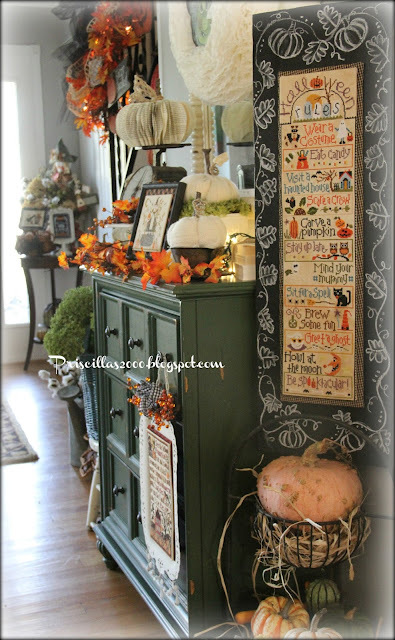 I need to do some Halloween rearranging and find it the perfect spot! You are so talented! I love how you find unique ways to frame your stitching! I have been checking with your blog every since you finished this piece to see how you would display it. I love it! You combined your love of chalkboard, fabric on the bias and your stitching in one! Wherever you put it, it will be a show stopper! That turned out so incredibly cute!! What a beautiful piece of work to display each October - nice job as usual! Wow!! Great job thinking out of the box. I love it!!! Yikes. It's darling. I didn't know there were rules but I love them. That's what Halloween is all about:). A beautiful job framing it! Just beautiful!! You are so talented!! A Trip To Utah..and Some Cross Stitch! Knock Knock .. Halloween is Coming! Trick Or Treat Stitchy Finish! Seasons In Chalk Christmas-ho ho ho!